Preheat oven to 350°F. 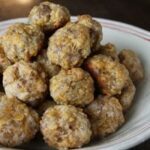 In a large bowl, combine sausage, cheese, and baking mix. It’s best to use your hands here. Then add the water gradually until it gets to the right consistency to roll into balls. Next, roll into balls about an inch to inch and a quarter in size and place on an ungreased baking sheet. Although, I prefer to cook mine on a Silpat mat or parchment paper.